Sir Antony Gormley is a British sculptor whose works are concerned with space we occupy within and without our bodies. Gormley has placed his sculptures around the world in site-specific locations, as the location of a piece is as important as the piece itself. His interest in humans is both intimate and symbolic. This Turner Prize-winning sculptor might make you change not only the way you look at sculpture, but also the way you look at human bodies. Built in 1998, the Angel of the North is a majestic, giant figure of an angel placed in Gateshead, near the A1. Being the longest numbered road in the UK, the A1 connects London with Edinburgh. Dominating the skyline, this 20-metre tall sculpture with a 54-metre wide wingspan is seen by approximately 90,000 drivers each day, plus 150,000 visitors who come to experience being in the presence of the Angel. The 200-tonnes of corten steel is placed in the north-east part of the UK to celebrate and commemorate the coal mine workers who for 300 years worked in mines underneath the surface of the region in which the sculpture stands. This life-size statue is placed in the crypt of the Winchester Cathedral, one of the largest cathedrals in England. It is probably the most mysterious sculpture by Antony Gormley. During rainy months the crypt floods and the floodwater combined with dull light creates a wonderful effect. The cast is taken from the artist’s own body. The lonely figure contemplates the water held in his palms and this gesture of the figure and its placement in the cathedral makes it transcendental, and spiritual, even though it is not directly related to religion. Exposure is a piece of public art that is created to react to the changing environment. Due to the changes caused by global warming, the concern is that of rising of sea levels. 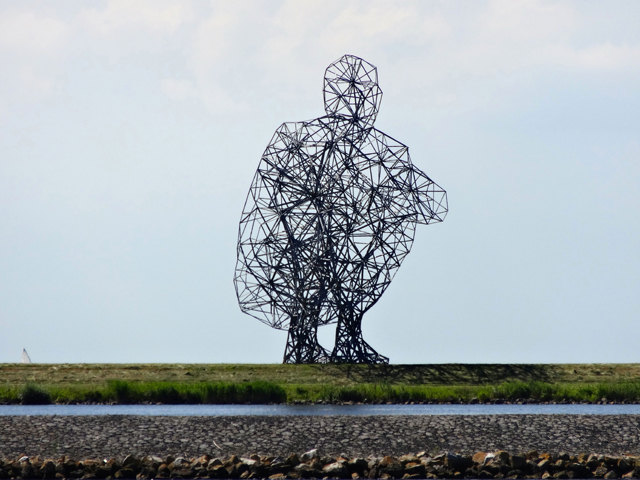 Gormley placed his squatting figure on a thin piece of land between the Dutch town of Lelystad and the sea. With time, as the water levels rise, the sculpture will gradually be buried in water. The figure is isolated, as there are no other constructions around it. This isolation makes it difficult to imagine the Exposure’s size, which is 25 metres high (5 metres taller than The Angel of the North). 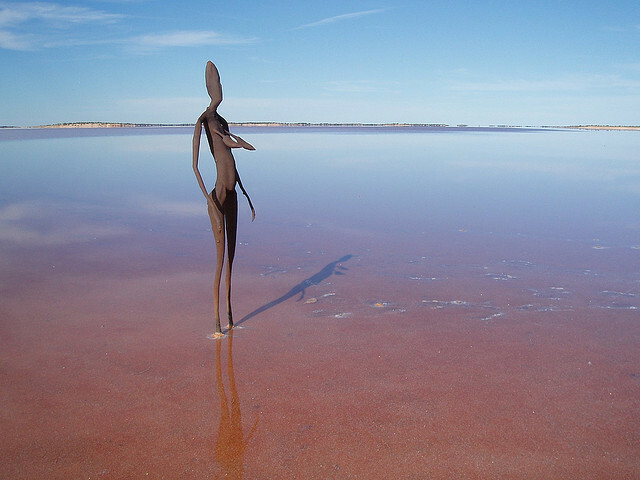 The installation consists of 51 works spread around Lake Ballard in Western Australia. They are roughly 750 metres away from each other; spread across the lake’s flat surface. Whenever you’re near one, you can see a thin, hair-like figure of another far on the horizon. The figures, again body-like, are based on scans of inhabitants of the nearby town. Their height remained original, but their thinness has been reduced, which makes them more mysterious and harder to spot. The casts have been produced using metals found in the region and were installed in 2003. 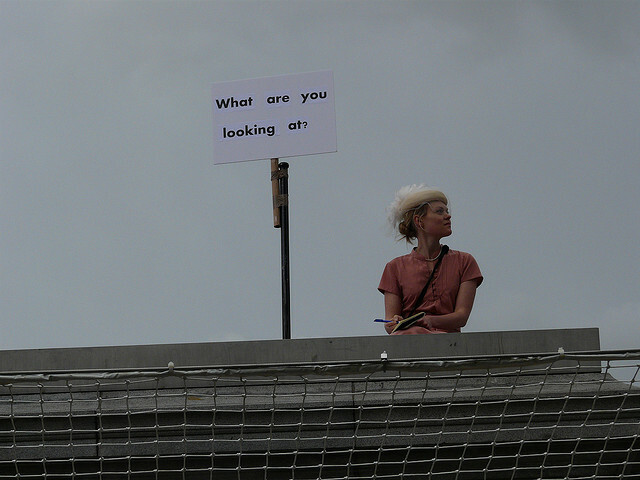 This public art project was commissioned for the Fourth Plinth in the London’s famous Trafalgar Square in 2009. Over 100 days, members of the public occupied the column and registered members stood on it for an hour. In total around 24,000 people participated. The variety of ideas and approaches brought the square to life, as no other installation before. The Fourth Plinth Programme is founded by the Mayor of London initiative that commissions contemporary artists to create public artwork for the empty plinth in the heart of London. The Fourth Plinth was built for the statue of William IV, but due to insufficient funds remained empty for 150 years, until 2003, when the programme began. 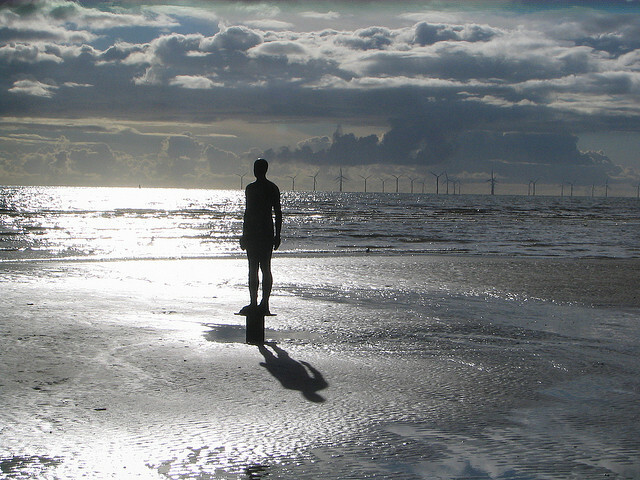 These iron casts of Gormley’s own body are placed at Crosby Beach in north-western England. There are exactly 100 of them and they all face out towards the horizon. The installation stretches over three kilometres of the shore and as far as one kilometre out to sea. Depending on the tide, the figures are more or less visible. At times water reaches up to their necks. This piece is another example of the artist’s dialogue with landscape and time. The figures were cast with their lungs inflated, which make them look tense but relaxed at the same time. Antony Gormley does not shy away from political issues. In 1987, he installed a 3-part sculpture in the city of Derry in Northern Ireland. 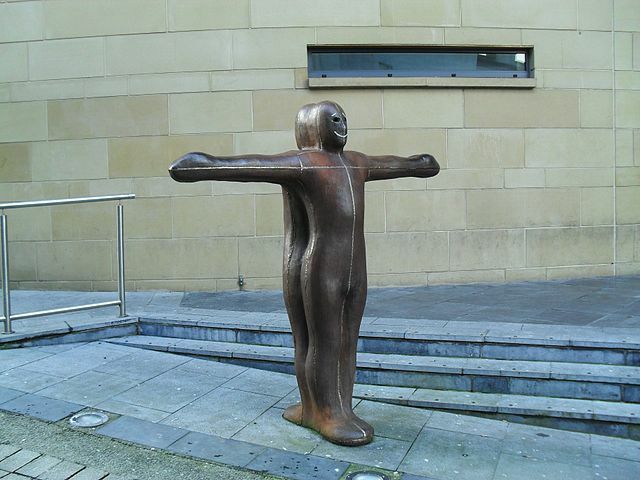 In the midst of the religious conflict, Gormley selected three spots along the Derry Walls; particular locations at important points overlooking either side of the wall. Each part of the sculpture consists of identical iron-cast figures positioned back-to-back with each other. They hold a crucifixion posture, signifying Christianity. Looking through the open eyes of one figure, you could see out through the eyes of the other. The two bodies joined into one represent Derry’s two dominant communities, divided by their religious and political beliefs, but connected by their Christianity and location. Model is a sculpture that also represents a body. Only this time the body is enlarged and the viewer is invited to walk into it. Built for the South Galleries of the London’s White Cube Gallery, the sculpture is both in space and consists of space. Wandering through the dark labyrinth of the structure’s connected chambers forced viewers to adjust their pace and become very careful and aware of the geometrical space. It was on display in 2012. Field is a product of the earth. Made out of clay, it is also a result of collective fabrication. The simple, little figures were produced in four different locations in the world, by local men, women and children, using local material. The installation grew bigger and more powerful each time it travelled, currently containing 210,000 bodies. 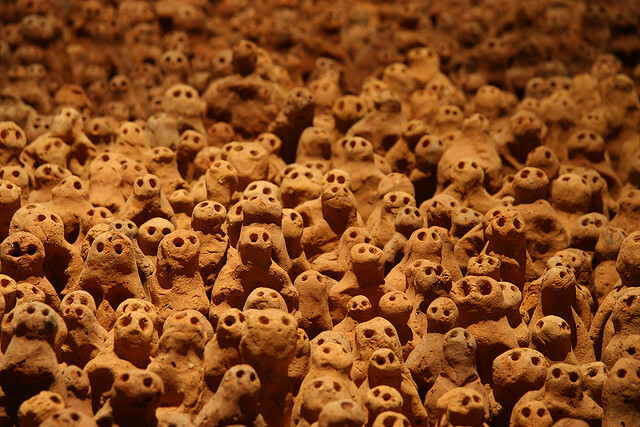 Gormley’s incentive was straightforward: produce a number of little figures and bring them to life by giving them eyes, so they can look back at us. They have no mouths, so they only look at us, and one cannot help but feel as though they are being judged by the silent army, which takes over an entire exhibition space. Breathing Room is an installation that focuses on the idea that human beings are the only creatures inhabiting constructed environments. Although there are three versions of this installation, the geometrical architecture of all the pieces resemble a drawing in space. However, it’s neither architecture nor an architectural drawing. In the third version, Breathing Room III from 2010, the edges of the construction are built from a luminescent material, which when the gallery lights go off, create a feeling of the matrix. Once again, the artist invites us to discover the sometimes-challenging relation between our bodies and the space they occupy.